Marketers and sales people love talking about the marketing funnel, essentially a visual representation of the purchase process. Understanding and leveraging your marketing funnel can help you identify opportunities, increase your conversions and turn your client base into loyal followers. The marketing funnel comes in many different variations, but they all boil down to what your prospects go through from the moment they hear about your services until they become your champions. The core idea behind the funnel is that you will lose people at each stage. Only a fraction of those who know about you will buy from you and even less will talk to others about you, and that’s fine. (You will have realised by now that the funnel analogy could be improved, but marketing colander isn’t as catchy!). The concept of the funnel is straightforward enough, but there are different interpretations of it. Each has a varying number of stages, and not all are labelled the same. Again, that’s fine. The main thing is to understand the overall idea. Over the years, I have found the variation below to be quite useful, particularly when speaking to non-marketers. Everybody can relate to it because we have all experienced it as consumers with our buying decisions. So, what are the stages of the funnel? First of all, people need to know that you exist. If they don’t know about you and your products or services, you have no funnel and, therefore, no business. In the awareness stage, you have to work on your visibility to make sure your target audience has you on their radar. Next, build the relationship with those that know you. If your leads like you and trust you, they are more likely to take things one step further and give your product or service their consideration. You want to make sure that they perceive your offering to tick all the boxes, so it’s added to their shortlist. The following step, the conversion, is when your contacts buy from you. In the conversion, you make the sale, and the purchase goes through. But selling should never be the end point to the relationship with your buyers. You want to keep your clients happy and ensure their loyalty. If they like what you do, they are much less likely to buy from your competitors next time. Your ultimate goal should be to delight your clients to the point that they are happy to recommend you to others. Successful businesses often have extremely high advocacy rates, which generate trust and boost growth. The marketing funnel should help you think about the customer journey and what your potential clients need at each stage. Leverage it by making sure you have strategies in place for each of the stages in the funnel. For awareness: Advertising, PR and networking have been the traditional ways to get the word out to potential clients, and they still work in many cases. However, these days you should also produce SEO-friendly content (e.g. blogs or guest blogging, social media, industry group discussions). (More on digital below…). For consideration: Plan activities to engage your target audience. Be helpful. Position yourself as a subject matter expert. Deliver value. Ideas include attending events where you know you will bump into your contacts, but also newsletters, landing pages and content that goes into more detail and answers specific questions. For conversion: Have a clear sales process designed to eliminate objections. Try to have answers to any last minute objections (a FAQ document or similar can work very well, as well as an automatic quote generator). Focus on eliminating “friction” by providing your clients with plenty of reassurance in the shape of examples, case studies or testimonials. For loyalty: For a start, do your job well or provide a good product. No matter how well designed your marketing strategy, it will flop if your offering doesn’t meet the expectations of your buyers. And don’t forget your clients once they buy from you. Design programs especially aimed at them (e.g. special offers and discounts, regular communications, satisfaction surveys). For advocacy: The best advocates for your brand are those that rave about it without you prompting them, but it doesn’t harm to encourage your existing clients to recommend you, for example by offering them incentives of some description. The funnel is a useful framework that can help you plan and structure your marketing activities. However, as we all know, real life is not clear-cut – and much less so when it involves digital channels. For example, suppose you offer an enticing and valuable piece of content for potential clients in the consideration stage. You may find that it goes viral and gets a lot of attention and downloads, but that the numbers never materialise into sales. Don’t be bitter and take it as a compliment: that’s the beauty of the Internet. At the same time, if you recruit a solid fan base, you may find that you are getting new clients without even trying. They may jump straight into the conversion phase and chose you, only because someone has recommended your products or services. Finally, digital has brought its own set of variations on the idea of the marketing funnel. If digital is your primary channel, check out SmartInsights’ RACE model (reach, act, convert, engage). Its primary focus is inbound marketing and what fuels it, namely quality content. 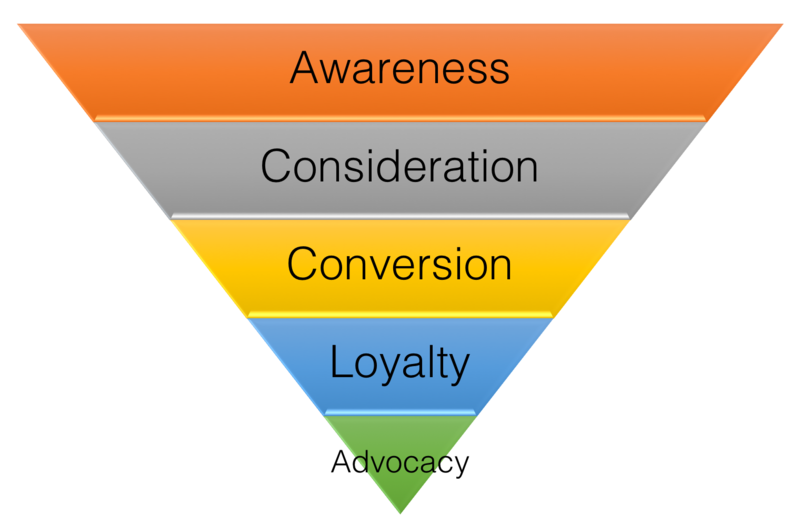 Do you use the concept of the funnel as part of your marketing strategy? What works best for you? Posted in marketing, marketing for freelancers, online marketing. Tagged campaigns, digital marketing, integrated marketing, marketing funnel, marketing planning, online marketing, RACE.